I grew up on Campbell’s cream of mushroom soup. It was one of my favourite comfort foods growing up. In addition to just eating it as a soup, I have also seen it used as a base for mushroom gravy and for various casserole dishes. The versatility of the product makes it a good pantry staple, however, since the focus of my blog is to compare store-bought versions against homemade versions I decided it was time to face another one of my favourite convenience items – Campbell’s cream of mushroom soup. Put a large frying pan over medium heat. Heat butter or oil until hot and add garlic and shallots. Cook for 1-2 minutes until shallots are translucent. Add mushrooms and sauté at medium-high heat, stirring frequently, for about 7-10 minutes until mushrooms begin to brown. Add a pinch of salt and pepper to the mixture as it cooks. Meanwhile, warm up the stock in a large pot. 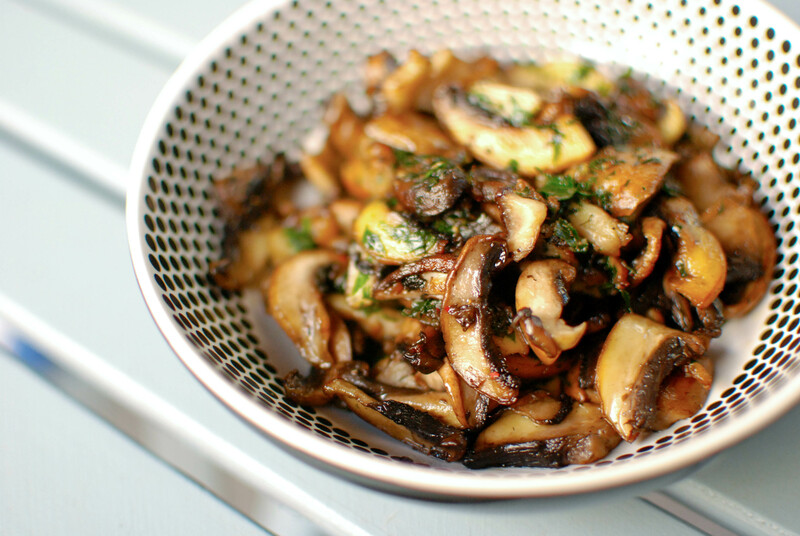 Add the sautéed mushrooms, garlic and shallots to the stock and heat it up to just under a boil. Take it off the heat and stir in the heavy cream (or half-and-half). Garnish with chopped, fresh parsley before serving. Of course this wouldn’t be a true Confessions of a Dietitian taste test unless I tried making the healthier version. So I made two types of cream of mushroom soup: one using heavy cream and one using half-and-half. I think the homemade version will have a more pronounced mushroom flavour and cleaner taste (because it isn’t filled with preservatives). I think the version made with heavy cream will have slightly more flavour than the version made with half-and-half due to the higher fat content. I think the canned version will have a chemical or metallic aftertaste because of how it’s made and stored. 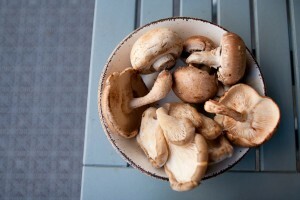 From a visual stand point, you could really see the pieces of fresh mushrooms in the homemade versions. The homemade versions were more beige in color (due to the butter in the recipe) which gathered and pooled along the edge (there was slightly less pooling in the full fat version – fat is a good emulsifier). The canned soup didn’t have any pooling of butter/oil along the edge but it also looked pale in comparison. You could barely see any mushroom pieces. From a flavour standpoint, both the homemade full fat and homemade lower fat soups had a stronger mushroom flavour compared to the canned version. The canned version tasted watery in comparison and the mushroom flavour was not as pronounced. Although the texture looked more homogenous in the bowl, it was not as smooth when we tasted it (there is something about fat that emulsifiers just can’t replicate). The taste testers also noted that it tasted a little chemically but overall, it was actually pretty good considering that it came out of a can. What can I say, Campbell’s does make good soup. 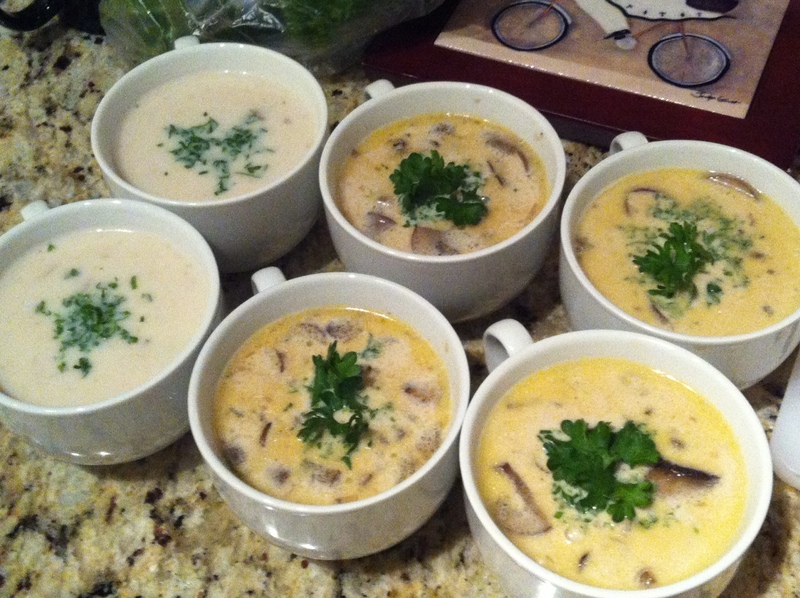 However, the flavour of the homemade versions were still much better and when making cream of mushroom soup it should really taste like mushrooms. 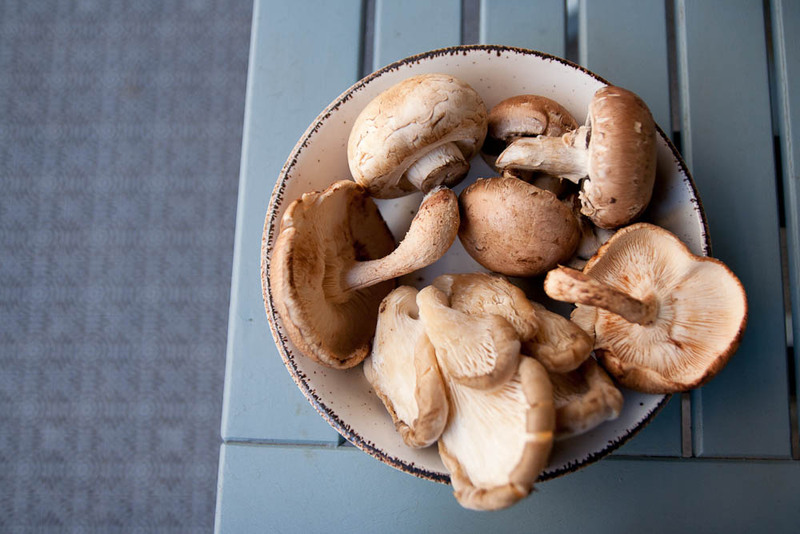 As a result, the homemade versions came out on top due to their stronger mushroom flavour and smoother texture. In terms of which homemade soup tasted better, I personally couldn’t taste a significant difference between the soup made with heavy cream and the soup made with half-and-half. If anything, the heavy cream soup had slightly (i.e. hardly noticeable unless you were really looking for it) more flavour and was slightly thicker (again, only if you were really looking for it). But with heavy cream soups I always end up feeling very full after eating them so I actually prefer the soup made with half-and-half. It has all the flavour of the full fat version without being so heavy. But as far as cream of mushroom soup in a can goes, Campbell’s is not bad. And considering that it lends itself to other applications (like mushroom gravy, casserole dishes and sauces) it’s something that I will still keep around in my kitchen since. At the end of the day, Campbell’s cream of mushroom soup is a pretty good shortcut. « There is nothing like homemade cranberry sauce	» What is red palm oil?